Apple has disappointed me for once. Unless you live under a rock, you probably know that Apple revealed their new Apple Watch yesterday. I had been super excited for this announcement. My hope was that the watch would allow me to ditch my Garmin and my iPhone while I run and also do tracking like a FitBit, which I’ve been holding off on buying until after the Apple Watch announcement. I’m sad that they did not deliver from a runner’s point of view. While I love the look of the device, and it has some nifty features (“We can sketch hearts to each other!” I texted to Jonathan during the reveal), it doesn’t do most of what I actually wanted it to do, in order to be useful to me–especially for $350+ price tag. To replace my Garmin, it would need GPS. It does not. It has to use the GPS from your phone. Thus, it obviously doesn’t replace my phone, which I don’t normally run with now unless I want music. (I hate running with my phone, and with phones getting bigger–that’s another topic for me to rant on–it’s really starting to look ridiculous having them strapped to your arm.) It can play music, so that is a definite plus, but without GPS, it is basically worthless for running. I’d have to wear it AND carry my iPhone. Or, more likely, end up wearing the Apple Watch and the Garmin together. Goofy. I also wanted it to have FitBit-like abilities, which it does, but it was alluded that you would need to charge it every night. This means no sleep tracking, which is really why I want a FitBit! Argh! One BIG positive is that it includes a built-in heart rate monitor. I hate wearing the chest strap, so I would love it in my watch! I’ve never been much of an Apple early adopter anyway (never had a proper iPod though iTunes was built into my Motorola Rokr, first iPhone was a 3G, still no iPad, Apple TV 3rd gen, and just got an iMac last year), but I think I’m definitely going to be waiting for version two of the watch. The device shows great promise, and I really hope they choose to include GPS in it and figure out wireless charging, so it won’t need to be removed while you sleep. Anyone out there thinking of getting one? 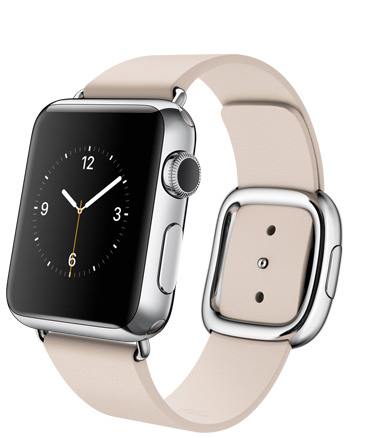 This entry was posted in Gear and tagged apple watch. Bookmark the permalink.